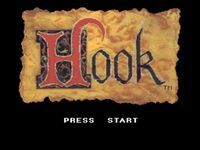 Hook is a side-scrolling game based on the movie Hook (1991), directed by Steven Spelberg. In the game, the player assumes the role of a grown up Peter Pan through 11 stages trying to rescue his children from the hands of Captain Hook. As in the movie, Peter Pan has the ability to fly. All you need is to find Tinker Bell's magic dust during the stages. However, your ability to fly is controlled by a meter. When your magic dust is out, you need to find Tinker Bell in order to be able to fly again. This game was released to SNES, Sega CD, Sega Genesis and Sega Game Gear systems. There is a different game released to NES system with the same name.